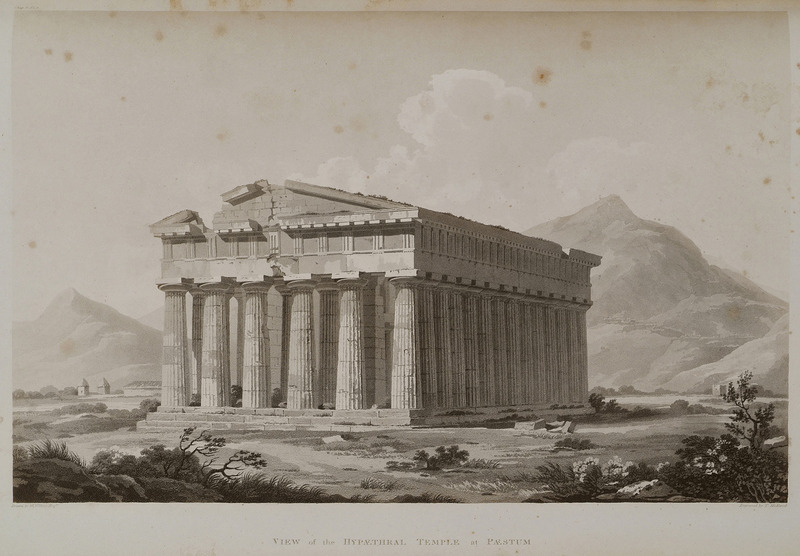 The Temple of Demetra in Paestum. 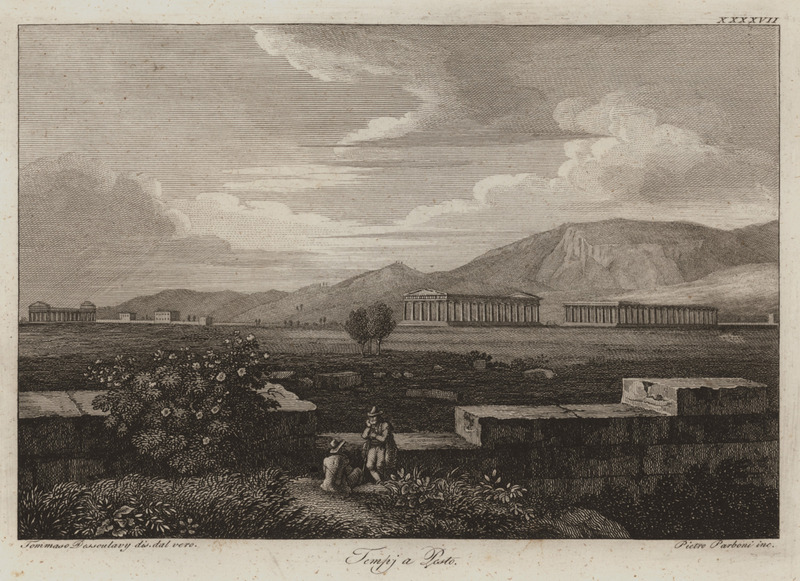 The two temples of Hera in Paestum. 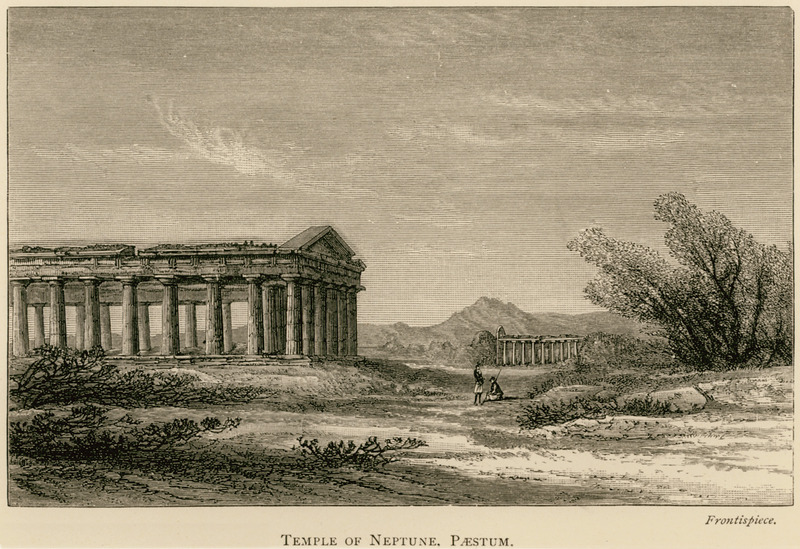 Temple of Poseidon in Paestum. 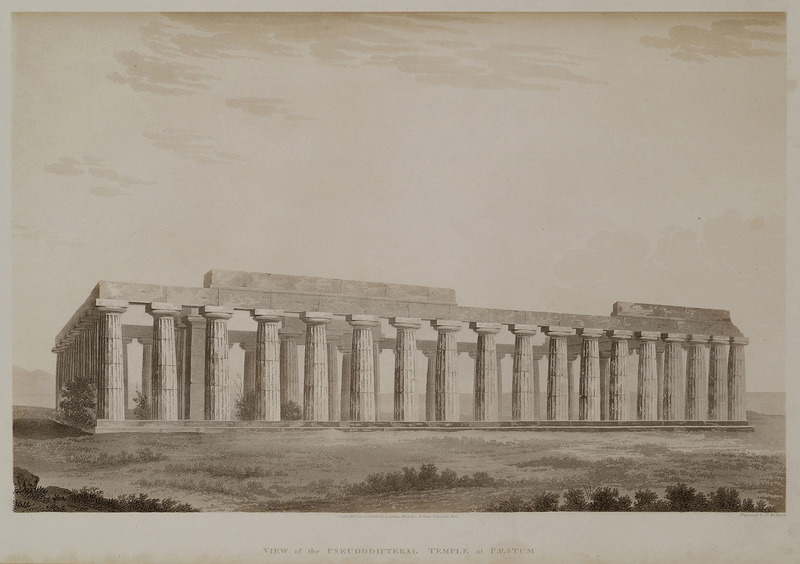 The Temple of Poseidon, Paestum. 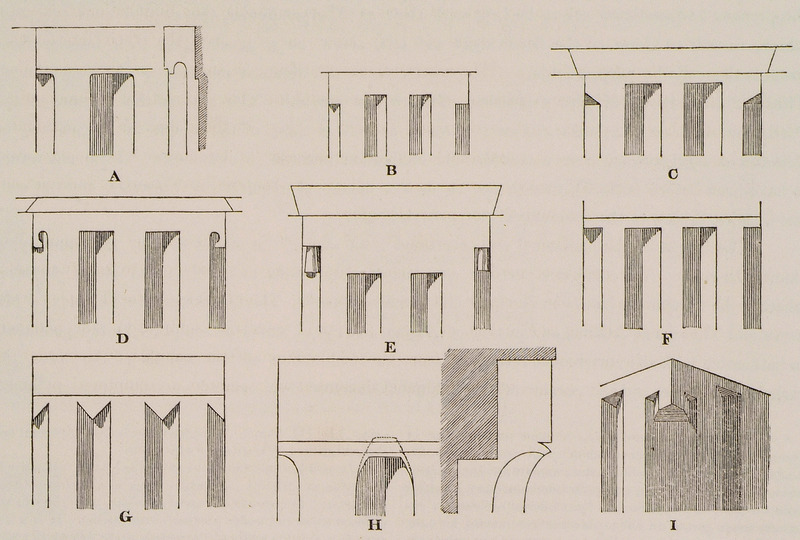 Comparison of peristyles from several Doric temples, showing the corner triglyph of each structure, in reference to the architectural question known as Doric corner conflict. 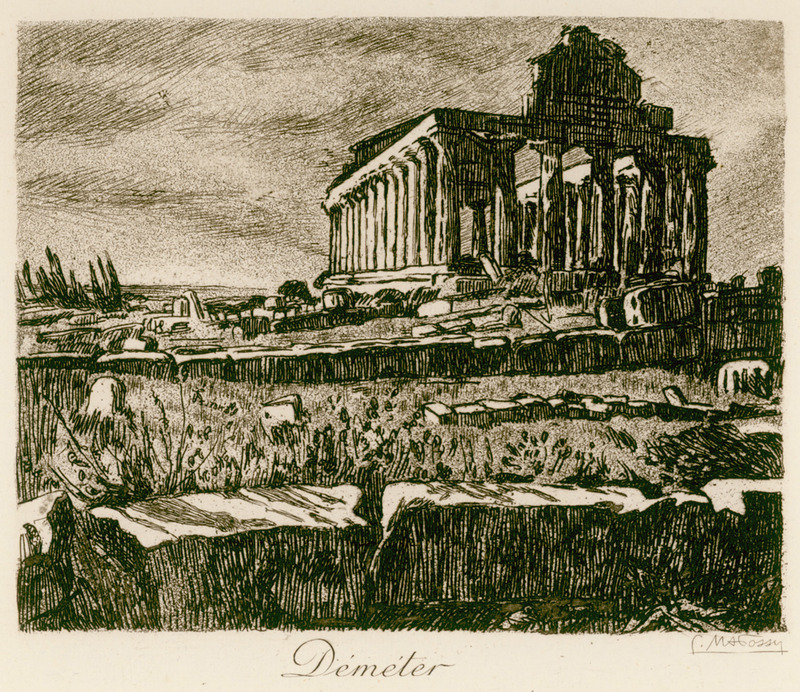 A: From the remains of temple close to Delphi, possibly the Tempe of Athena Pronaia. B: From temple at Heraclea, Asia Minor. C, D: From the temples at Priene. E: From Halicarnassus. 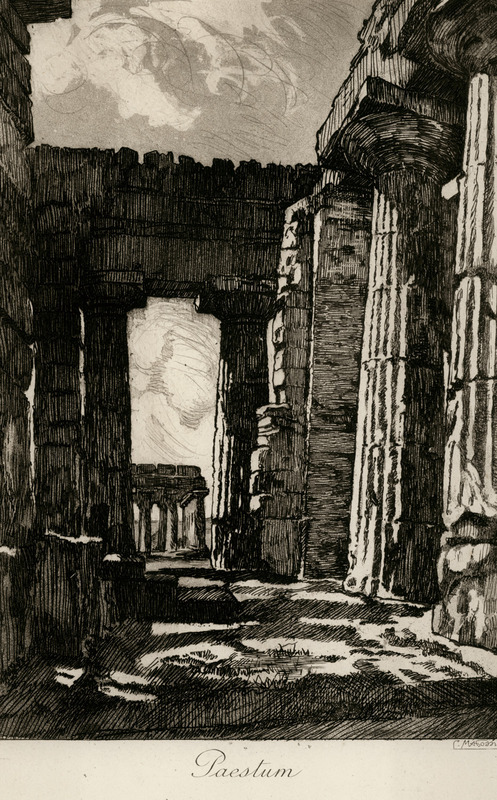 F: From the Doric Stoa of the ancient Agora of Athens, as drawn by Stuart G: From Selinunte, Sicily. H: From Paestum I: From Knidus. Imaginary representation of the pronaos, cella and adyton of the Temple of Solomon in Jerusalem. 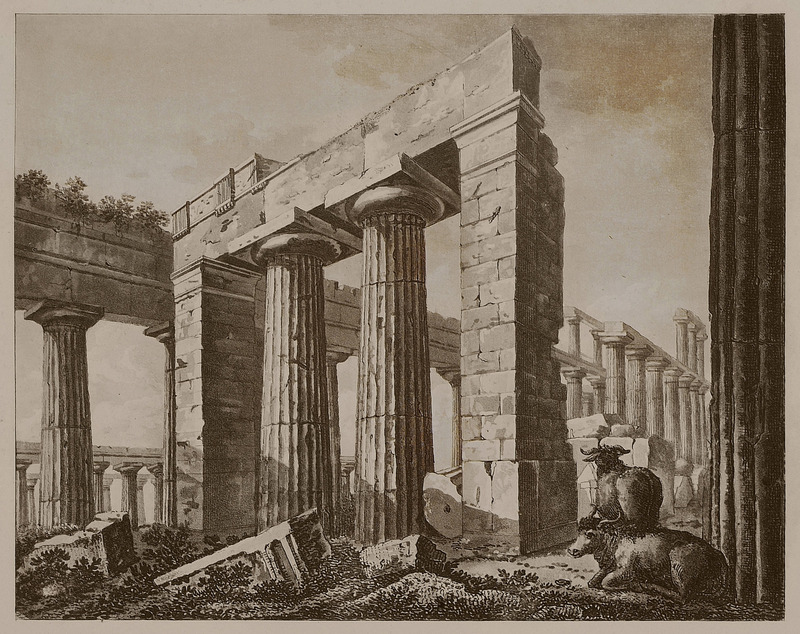 For this representation, the author claims to have been inspired by the Second Temple of Hera in Paestum in Italy. 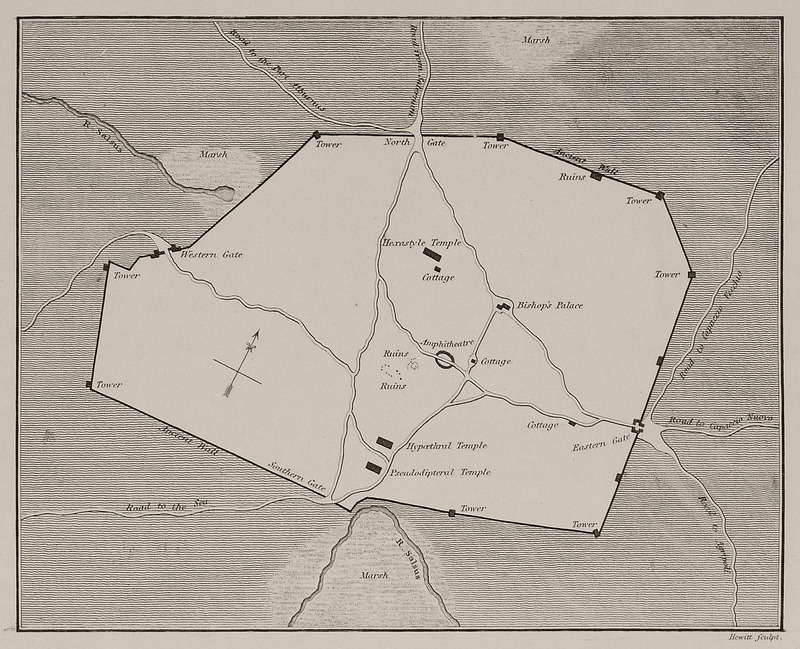 With dotted lines, however, the differences between these two temples are shown. 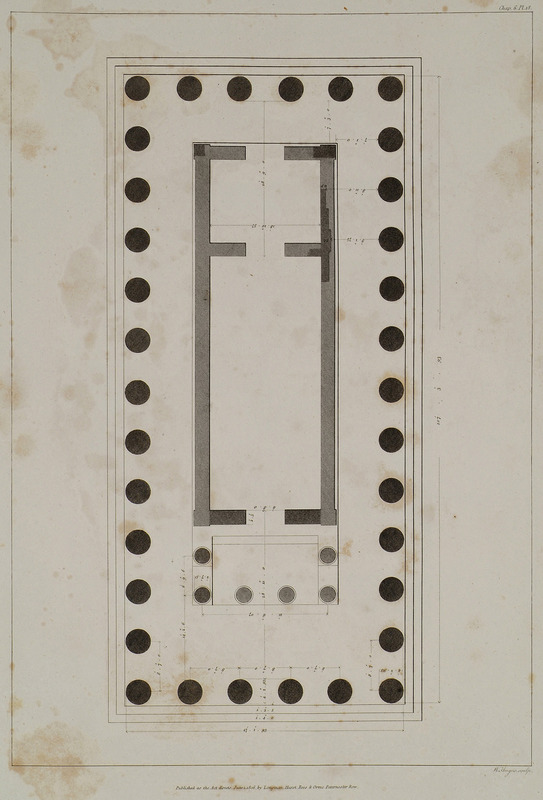 Plan of the Second Temple of Hera in Paestum, Italy. Map of Paestum in Italy. Ruins of ancient temples in Paestum, Italy. 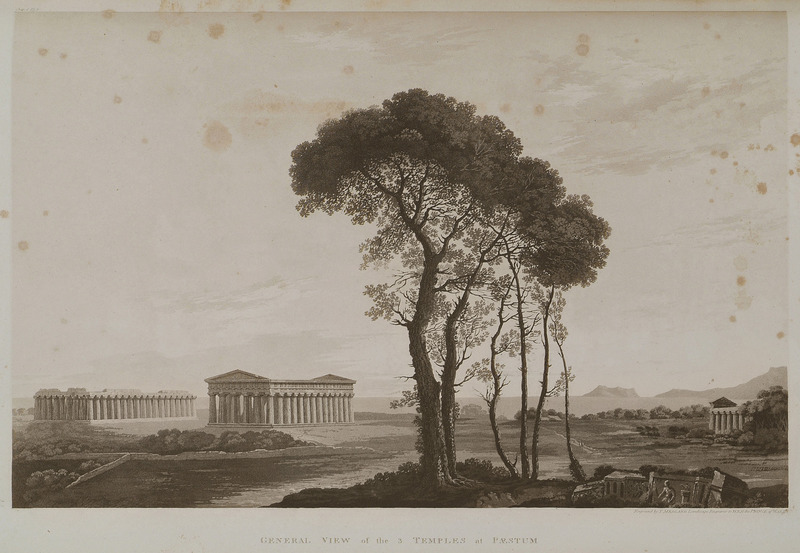 View of the Temple of Hera (on the left) and the Temple of Athena (on the right) in Paestum, Italy. View of the Second Temple of Hera in Paestum, Italy. 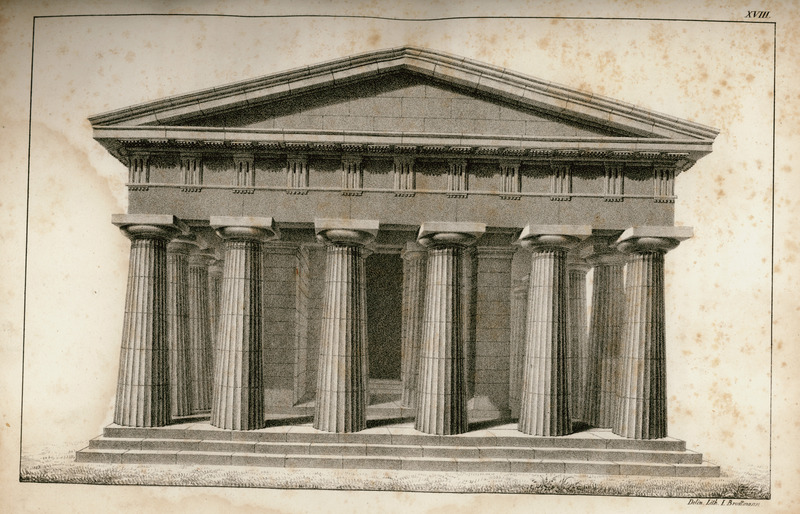 Reconstruction of the front of the Second Temple of Hera in Paestum, Italy. 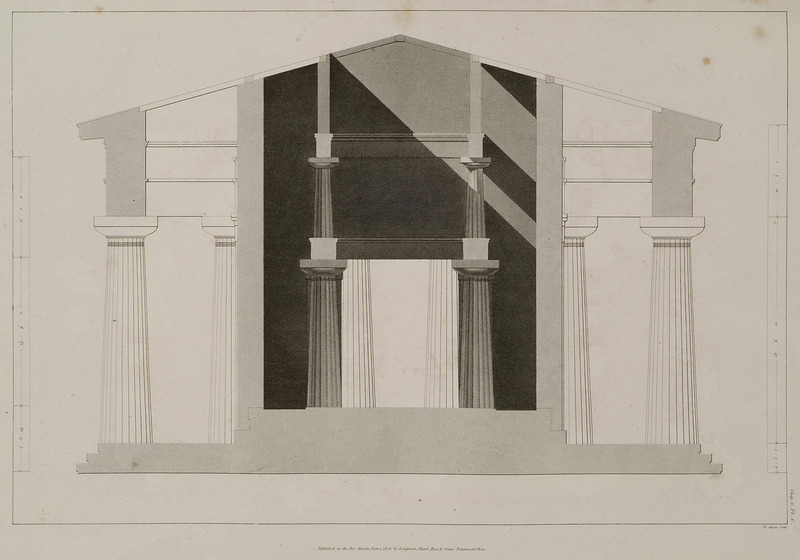 Reconstruction of the part between pronaos and outer peristyle in the Second Temple of Hera in Paestum, Italy. 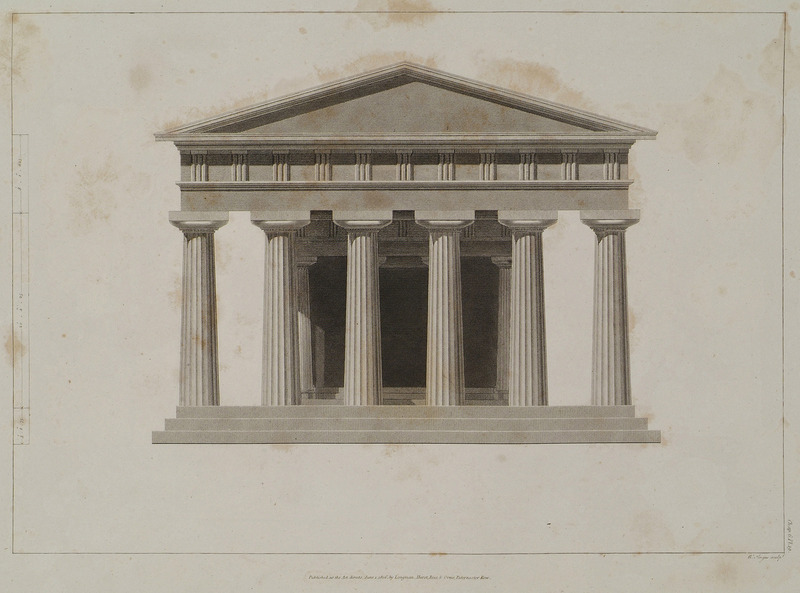 Second Temple of Hera in Paestum, Italy: Drawing of stylobate, column, capital of the column and part of the entablature of the outer peristyle. 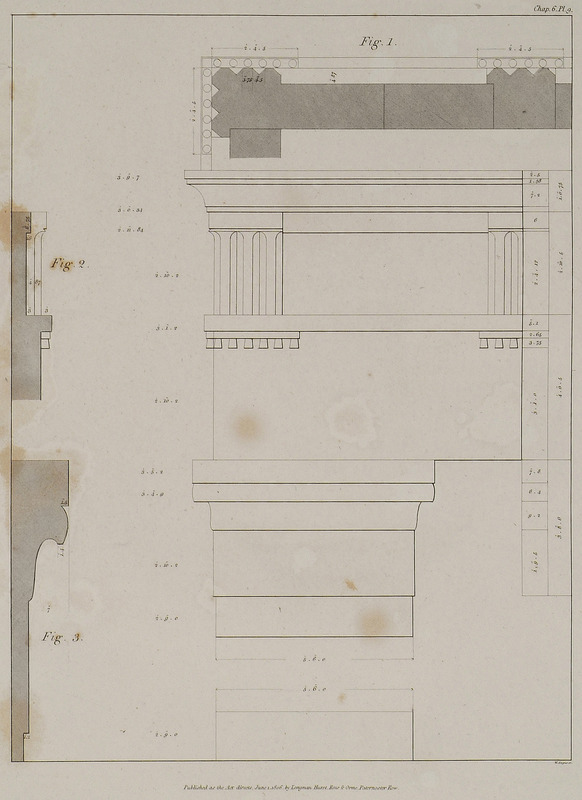 Section plan of the entablature of the outer peristyle. 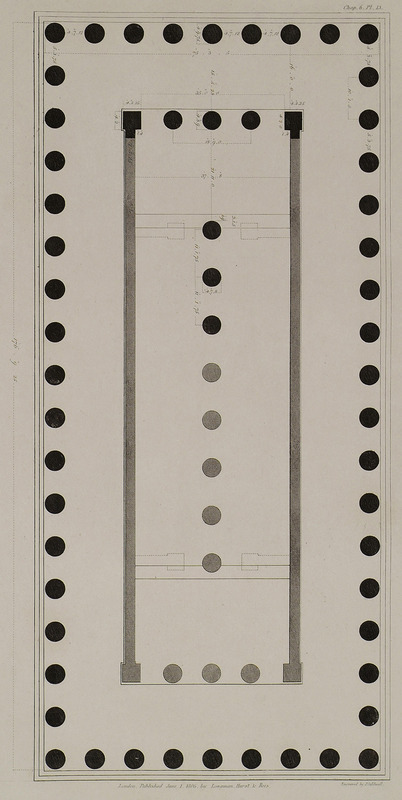 Plan of the triglyph of the outer peristyle. 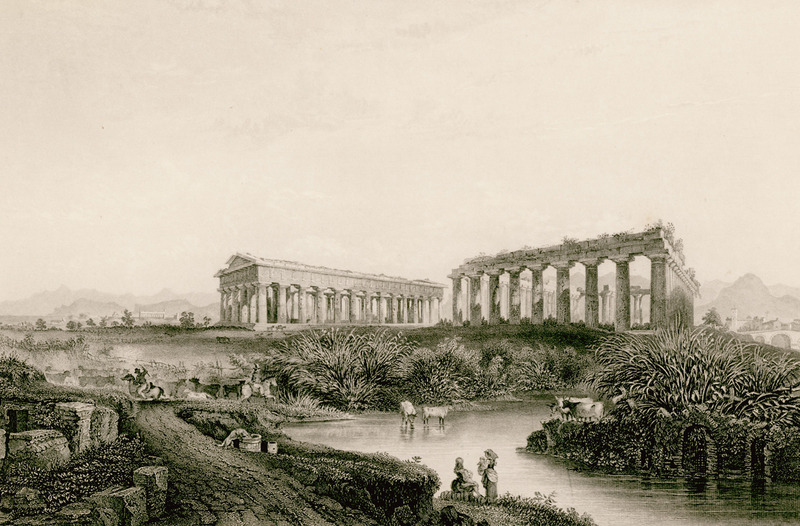 Second Temple of Hera in Paestum, Italy: Fig. 1. 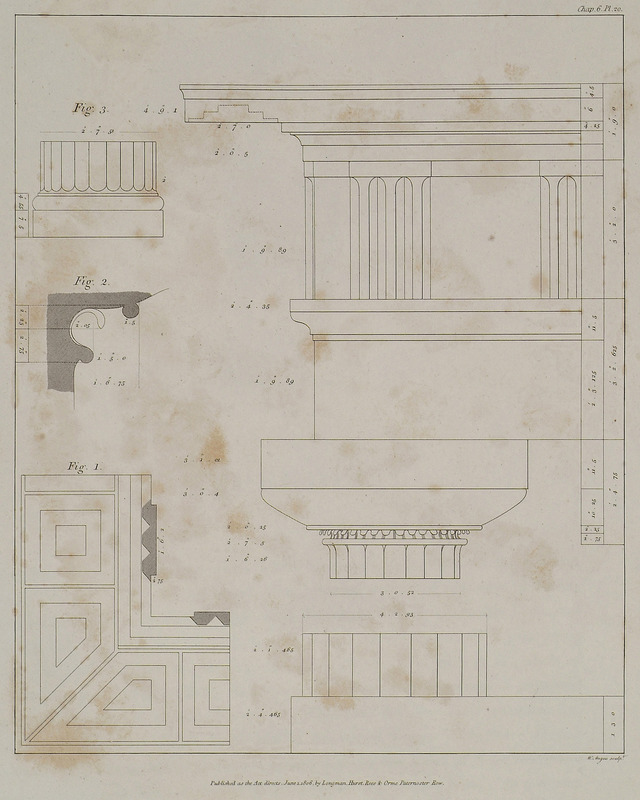 Half plan of the entablature of pronaos: triglyph, metops etc. 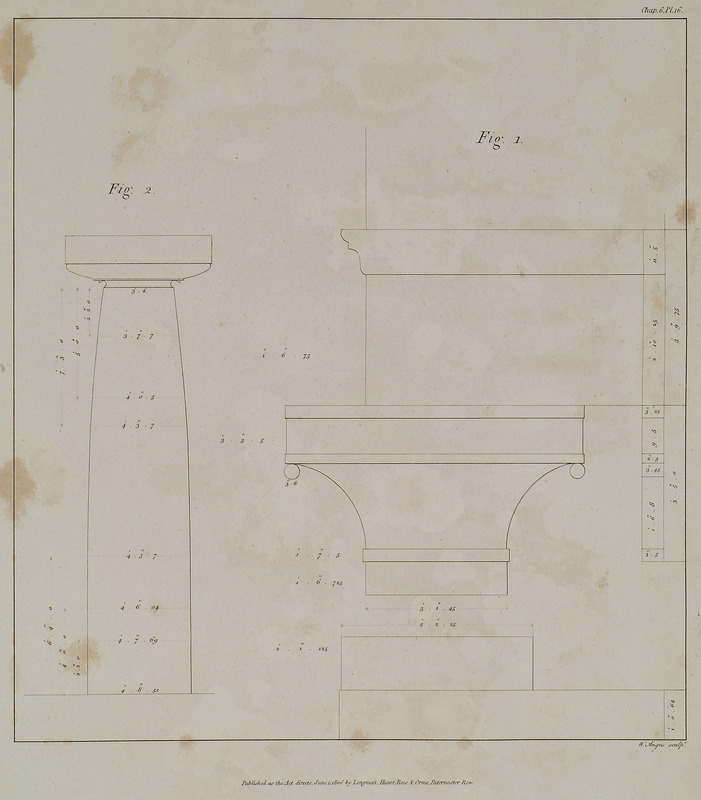 Drawings of column, capital of the column and part of the entablature of pronaos. Fig. 2. Section plan of the triglyph. Fig. 3. 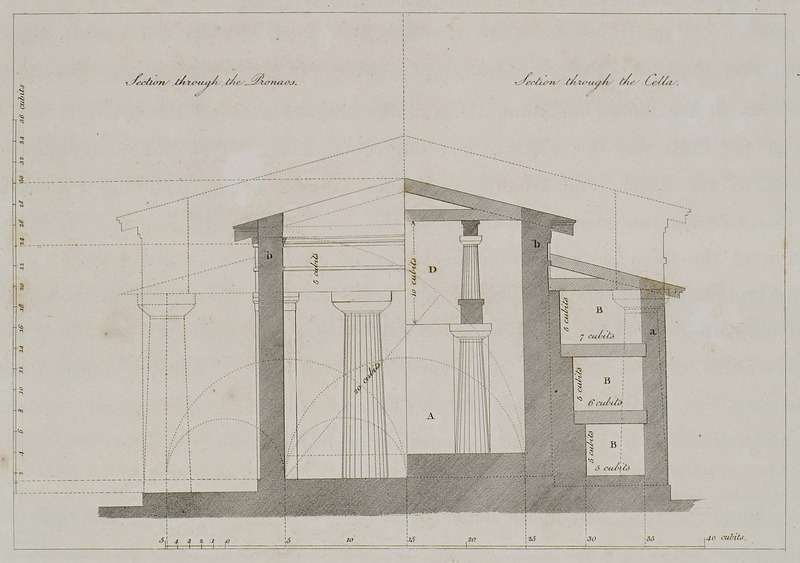 Section plan of abacus, capital of the column and column of the pronaos. Views of columns, capital of the column, abacus, and other architectural elements of the inner peristyle of the Second Temple of Hera in Paestum, Italy. View of the Temple of Hera in Paestum, Italy. 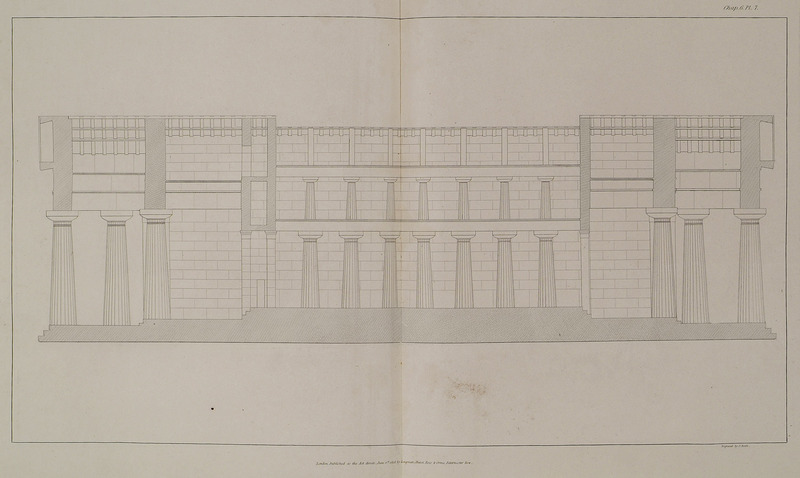 Plan of the Temple of Hera in Paestum, Italy. 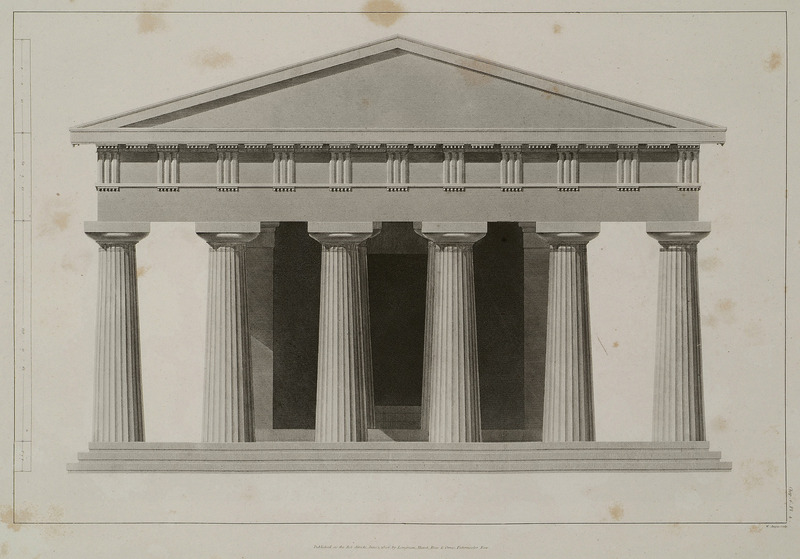 Reconstruction of the pronaos of the Temple of Hera in Paetsum, Italy. 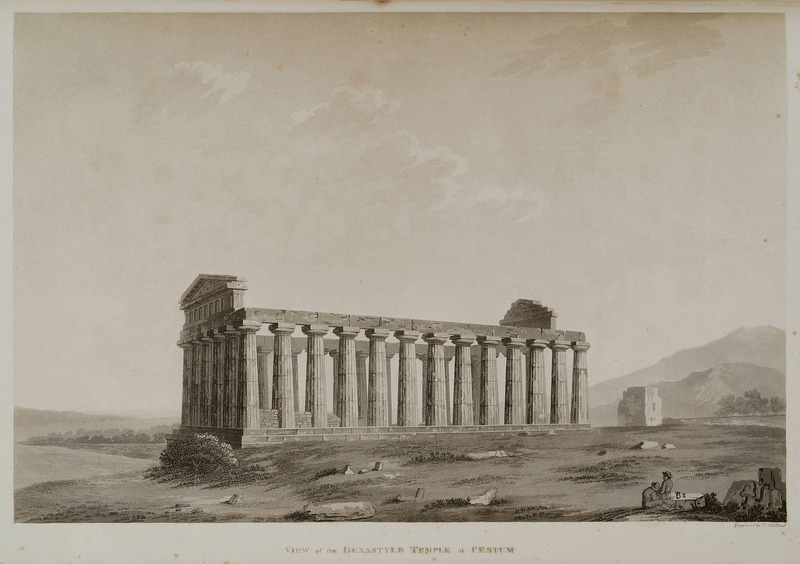 Temple of Hera in Paestum, Italy: Fig. 1. 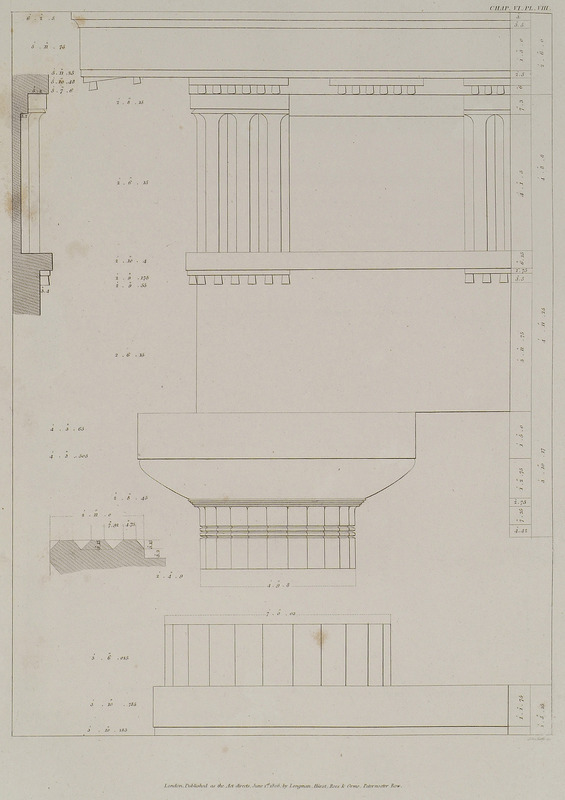 Plan and drawing of the entablature together with view of the capital of the column and the column of the peristyle. Fig. 2. 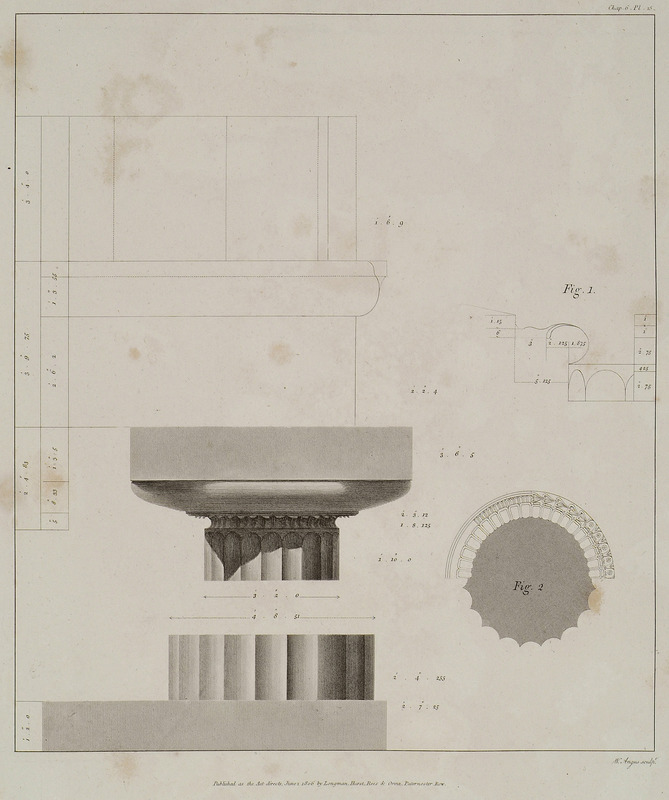 Bottom view of the column with details of the decorative elements underneath the echinus. Temple of Hera in Paestum, Italy: Fig. 1. Capital of the antae of the pronaos. Fig. 2. 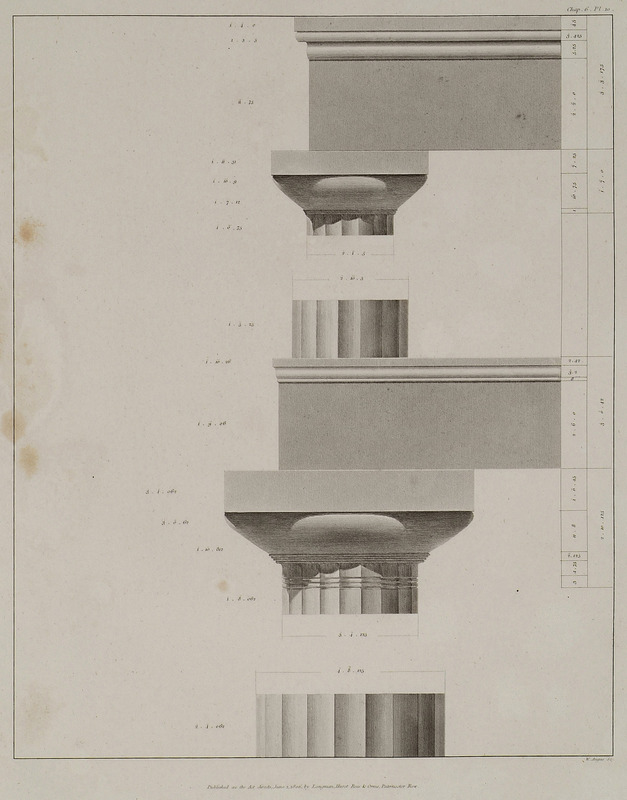 The contour of the shafs of the columns, shewing the diameters at different heights. View of the Temple of Athena in Paestum, Italy. 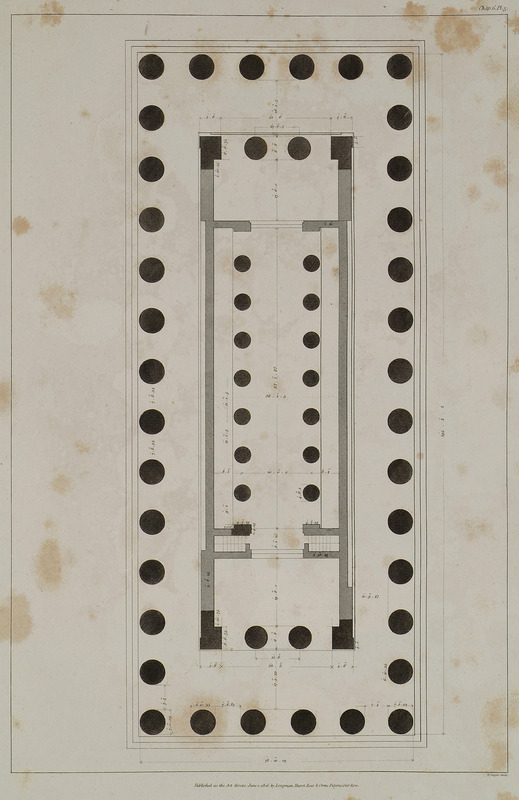 Plan of the Temple of Athena in Paestum, Italy. 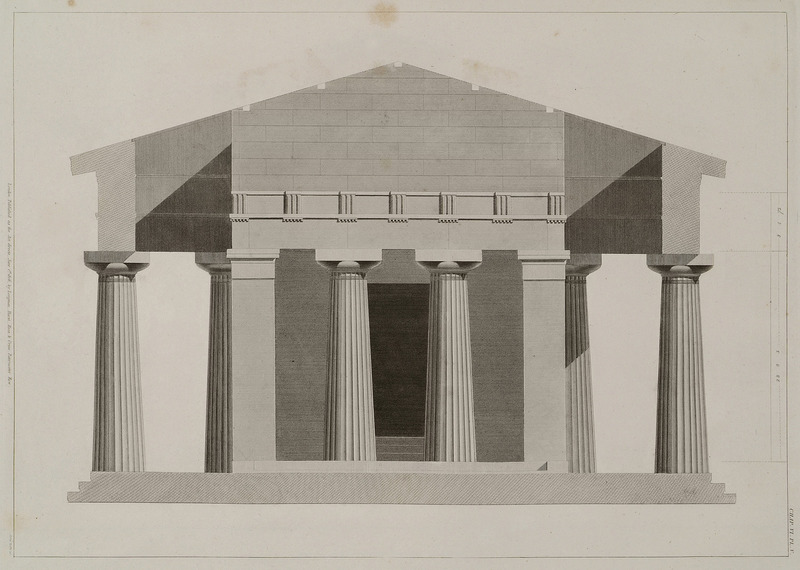 Reconstruction of the front of the Temple of Athena in Paestum, Italy. 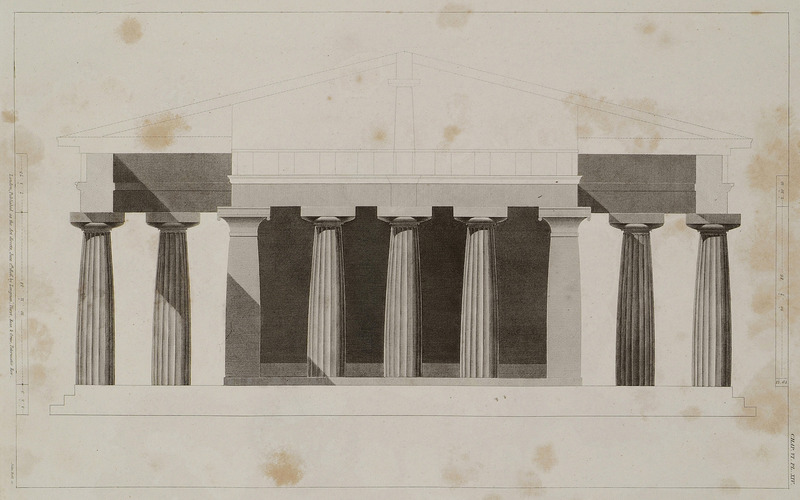 Temple of Athena in Paestum, Italy: Drawings of crepid, column, capital of the column and part of the entablature in the corner. Fig. 1. The soffite of the principal member of the cornice. Profile of the necking of the capital. Fig. 3. The base and part of the shaf of the columns of the pronaos.